Councilman John Gunderson appears to have suggested something practical. Employing aerosol writers to beautify Modesto and develop a colorful, creative attraction for a city lacking in originality. There’s just one problem. He’s opposed by Councilman Dave Lopez, who is advocating for the same failed idea that has never worked! Councilman Lopez is the driving force behind Partners in Paint, “a private / public partnership in graffiti abatement.” Its unclear what sort of partnership this is, but the website is highly upset at the high cost of graffiti abatement in Modesto. The unoriginal and ineffective solution that they propose? Keeping painting over these walls and creating blank targets for continued vandalism. Criminalize the youth and invalidate their creativity. Of course, “No one is talking about the city paying for this art, so presumably any policy would have to do with what might be acceptable art paid for by someone else, whether a charity or business or individual.” So commissioned art still needs to be deemed acceptable? 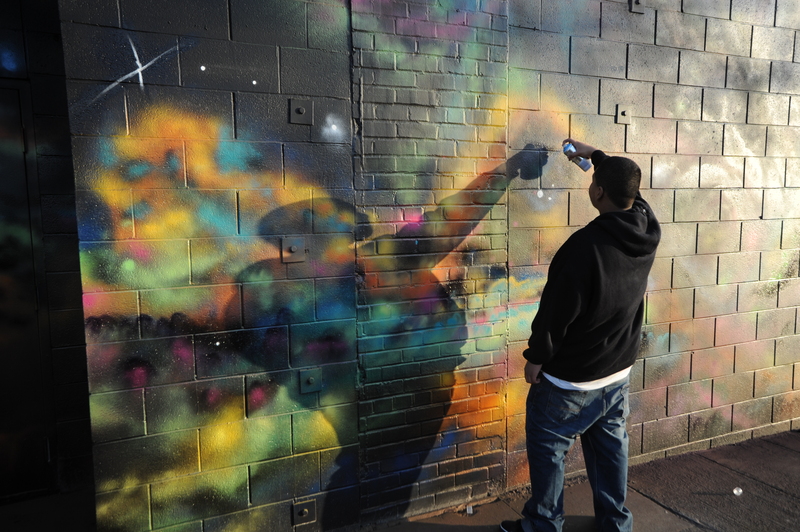 We can expect an interesting discussion in coming months over whether Modesto should encourage — or nix — murals that some might call art but others consider graffiti or vandalism. Councilman John Gunderson wants more and different kinds of art in downtown Modesto — a laudable goal in concept — but he ran into the objections at the first level of discussion, the council’s Safety & Communities Committee on which he serves. The committee is chaired by more senior Councilman Dave Lopez, the driving force behind Partners in Paint, whose goal is to get graffiti covered up as quickly as possible. That effort has about 180 volunteers. Dave Geer, the other committee member, represents the southwest area that suffers some of the worst graffiti problems. His reluctance was obvious as well. Gunderson has a different take, suggesting the city should “engage these kids in constructive ways” and make up for cuts in in the schools arts programs. Elected to the council a year ago, Gunderson also didn’t realize that the city had a public art committee as part of its Culture Commission, and that the committee has talked about public art for years. In fact, a draft set of guidelines for city-owned artwork that has languished for several years. Apparently no one on staff told Gunderson about the public art committee, so the poor communication goes both ways. Some of those committee people will be part of a task force that Gunderson will lead to pursue his idea. No one is talking about the city paying for this art, so presumably any policy would have to do with what might be acceptable art paid for by someone else, whether a charity or business or individual. This will be Gunderson’s opportunity to show he can advance an idea, bring the key parties to the table and emerge with a meaningful policy proposal for consideration by the full council. He obviously faces some skeptics. It didn’t help that the mural discussion followed a police department report on rising crime in the city, especially burglaries.